Oncogenic fusion gene Echinoderm Microtubule-associated protein-Like 4-Anaplastic Lymphoma Kinase (EML4-ALK) contributes to tumorigenesis of a subset of non-small cell lung cancer (NSCLC). Recently, we demonstrated that F-circEA-4a, a tumor-promoting circular RNA (circRNA) generated from the back-splicing of EML4-ALK variant 3b (v3b), is a novel liquid biopsy biomarker for NSCLC. However, circRNAs produced from EML4-ALK gene and their roles in NSCLC are not well-characterized. Here, we identify another EML4-ALK-v3b-derived circRNA, F-circEA-2a, harboring “AA” (rather than “AAAA” in F-circEA-4a) motif at the junction site. F-circEA-2a mainly locates in the cytoplasm and promotes cell migration and invasion, but has little effect on cell proliferation. Moreover, F-circEA-2a exists in tumor, but not in the plasma of NSCLC patients with EML4-ALK fusion gene, further supporting the significant diagnostic value of F-circEA-4a for EML4-ALK-positive NSCLC. 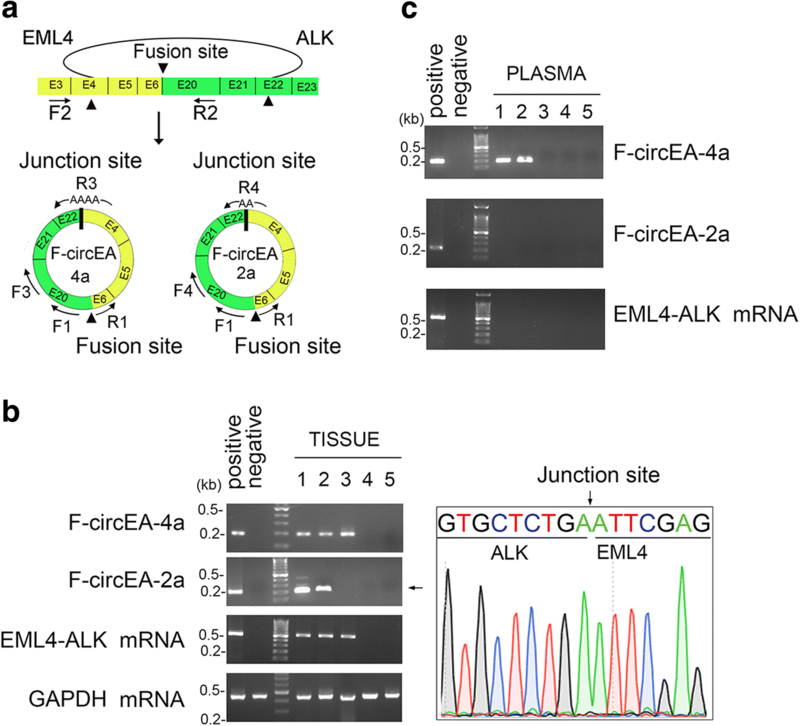 This work finds a novel oncogenic circRNA generated from EML4-ALK fusion gene, highlighting the pivotal role of circRNA in EML4-ALK-positive NSCLC development. Lung cancer is the leading cause of cancer death worldwide, in which non-small cell lung cancer (NSCLC) is a main subgroup accounting for approximately 85% of all lung cancer cases . NSCLC patients are often diagnosed at advanced stage and their 5-year survival rate is extremely low . Thus, investigation of NSCLC-associated process is urgent for NSCLC diagnosis and treatment. A subset of NSCLC harbor fusion gene which encodes fusion protein to exert oncogenic phenotype. For example, Echinoderm Microtubule-associated protein-Like 4-Anaplastic Lymphoma Kinase (EML4-ALK) fusion gene is present in 4–5% of NSCLC cases and generates EML4-ALK fusion protein to activate ALK-associated oncogenic signaling and promote NSCLC progression [3–5]. However, their underlying mechanism in NSCLC remains obscure. Circular RNAs (circRNAs) are a special subtype of non-coding RNAs with circular covalently-bonded structure, which endows them higher tolerance to exonucleases. Due to their conservation, abundance and specificity, circRNAs participate in diverse physiological and pathological processes, including tumorigeneisis . Increasing evidence demonstrate that circRNAs derived from the back-splicing of fusion gene are alternative entities involved in cancer development besides fusion proteins. For instance, the circRNA generated by MLL/AF9 fusion gene (f-circM9) in leukemia shows pro-proliferative and pro-oncogenic activities . Additionally, we recently demonstrated that fusion gene EML4-ALK variant 3b (v3b) produces an oncogenic circRNA (F-circEA-4a) with “AAAA” motif at the junction site. Importantly, F-circEA-4a could be detected in the plasma of EML4-ALK-positive NSCLC patients, acting as a potential liquid biopsy biomarker . However, circRNA-producing potential of EML4-ALK gene and the role of these circRNAs in NSCLC are not fully understood. Here, we identify another circRNA F-circEA-2a produced from EML4-ALK-v3b with “AA” motif at the junction site. Moreover, F-circEA-2a has little effect on cell proliferation, but promotes cell migration and invasion in NSCLC cells, highlighting the critical role of circRNAs in EML4-ALK-positive NSCLC. 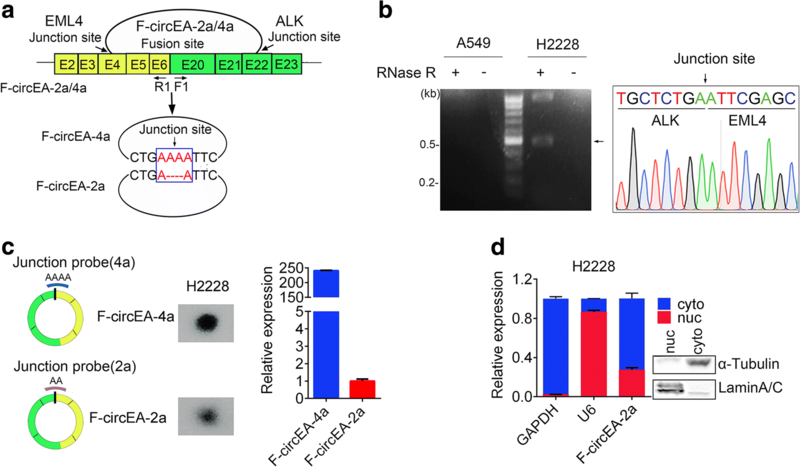 We recently identified the existence of EML4-ALK-derived circRNA F-circEA-4a. To evaluate whether EML4-ALK fusion gene could produce other circRNAs, we deeply Sanger-sequenced the reverse transcription PCR (RT-PCR) products using divergent F1/R1 primers (Fig. 1a) from H2228 (harboring EML4-ALK-v3b) and A549 cells (without the fusion gene, negative control). Besides F-circEA-4a, we found the presence of another circRNA named as F-circEA-2a with “AA” motif at the junction site in the RNA sample from H2228 cells, which was treated with RNase R to remove linear RNAs (Fig. 1b). F-circEA-2a, about 0.55 kb in length, is the back-splicing product between 5′-head of EML4 exon4 and 3′-tail of ALK exon22 (Fig. 1a). Dot blot hybridization using 32P-labeled probes across the respective junction sites indicated that the enrichment of F-circEA-2a in H2228 cells was less than that of F-circEA-4a (Fig. 1c, left), which was further confirmed by quantitative PCR (qPCR) (Fig. 1c, right). Subcellular fractionation and qPCR assays showed that F-circEA-2a was mainly located in the cytoplasm (Fig. 1d). These data demonstrated the presence of another circRNA F-circEA-2a produced from EML4-ALK fusion gene. To investigate cellular function of F-circEA-2a, we constructed F-circEA-2a-expressing plasmid, in which F-circEA-2a sequences (red arrows) and the flanking sequences (green arrows, favorable for circRNA formation) were cloned into pCDH-CMV-MCS-EF1-puro vector (Fig. 2a). Sanger sequencing of RT-PCR products from the cells transfected with F-circEA-2a-expressing plasmid indicated that F-circEA-2a was successfully expressed and correctly back-spliced (Fig. 2b). The ectopically expressed F-circEA-2a was predominantly located in the cytoplasm of both H1299 and A549 cells (Fig. 2c and d), same as the endogenous one in H2228 cells. Both MTT and colony formation assays suggested that ectopically expressed F-circEA-2a had no significant effect on cell proliferation in A549 and H1299 cells (Fig. 2e, f and g). However, F-circEA-2a enhanced cell migration and invasion in both cells by Transwell assays and wound-healing experiments (Fig. 2h and i). Because both F-circEA-4a and F-circEA-2a can promote cell migration and their difference is that F-circEA-4a has extra AA dinucleotides at the junction site, so they may exert the cellular function through the same mechanism. Emerging evidence shows that circRNAs play an important role under physiological or pathological conditions. For example, circMTO1, down-regulated circular RNA in hepatocellular carcinoma (HCC), suppresses HCC progression by acting as the sponge of oncogenic miR-9 to promote p21 expression . 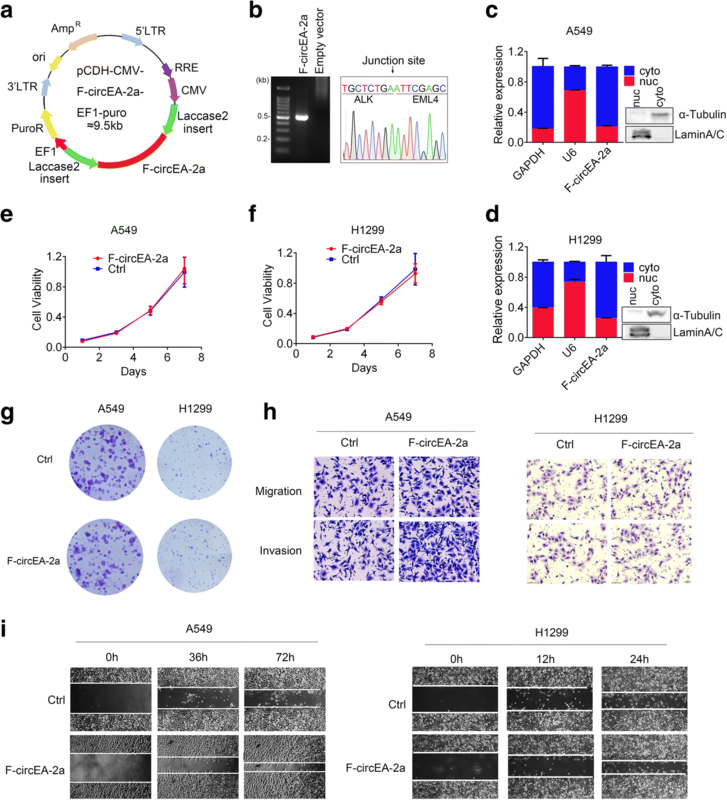 These data reveal a novel circRNA F-circEA-2a enhances cell migration and invasion without any influence on cell proliferation, enlarging the understanding of circRNA as oncogenic molecule participating tumor development. Compared to linear RNAs, the covalently-bonded circRNAs are relatively resistance to RNase R digestion. Some circRNAs (such as circ-N4BP2L2, circ-GSE1) originated from cancer tissues may enter the circulating system and stably be present in intercellular fluid . Our recent work indicates that F-circEA-4a is a potential liquid biopsy biomarker for EML4-ALK-positive NSCLC patients . To investigate the clinical significance of F-circEA-2a, we measured F-circEA-2a levels in tumor tissues and plasma of three NSCLC patients with EML4-ALK-v3b translocation and two NSCLC patients without such fusion gene. The convergent primers (F2/R2) were also used to detect EML4-ALK fusion mRNA. To improve specificity, we designed nested divergent primers (Fig. 3a, first round PCR primers: F1/R1; nested PCR primers for F-circEA-4a: F3/R3, nested PCR primers for F-circEA-2a: F4/R4). The R3 and R4 primers were designed to cross the junction sites of F-circEA-4a and F-circEA-2a, respectively, facilitating specific detection of these circRNAs (Fig. 3a). RT-PCR and Sanger sequencing data demonstrated that F-circEA-4a, F-circEA-2a and EML4-ALK mRNA were all detected in the tumor tissues of NSCLC patients with EML4-ALK-v3b translocation, whereas they were absent in the patients without such fusion gene (Fig. 3b), indicating the specific existence of F-circEA-4a and F-circEA-2a in the EML4-ALK-positive NSCLC tumors. However, in contrast to F-circEA-4a, we failed to detect F-circEA-2a in the plasma of EML4-ALK-positive NSCLC patients (Fig. 3c), which may be caused by low enrichment or a discrepant junction motif of F-circEA-2a. These results provided a rebuttal that F-circEA-4a is a promising biomarker for EML4-ALK-v3b translocation, highlighting its uncontroversial role in the liquid biopsy of EML4-ALK-positive NSCLC patients. In summary, a novel circRNA F-circEA-2a produced from the EML4-ALK fusion gene was identified and mainly located in the cytoplasm to promote cell migration and invasion in lung cancer cells. Shuangyan Tan and Dan Sun contributed equally to this work. We’d like to thank Prof. Jeremy E. Wilusz for providing the plasmid pcDNA3.1(+) Laccase2 MCS Exon, and all of our laboratory members for discussions. This work was supported by the National Key R&D Program of China (2017YFA0504304 and 2016YFA0502204 to Y.P. ), National Natural Science Foundation of China (81772960 and 81572739 to Y.P. ), and Graduate Student’s Research and Innovation Fund of Sichuan University (2018YJSY017 to D.S.). All data obtained and/or analyzed during the current study were available from the corresponding authors in a reasonable request. YP, YZ and YW conceived and designed the project; ST, DS, WP, QG and JL performed the experiments and interpreted data; CG, YG and LL collected NSCLC patients’ samples; all authors read and approved the final manuscript. The human cancer tissues and plasma used in this study were approved by the Ethics Committee of West China Hospital of Sichuan University. We have received consents from individual patients who participated in this study. The consent forms will be provided upon request.